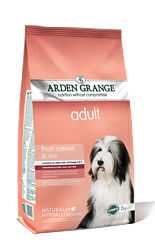 Arden Grange Salmon and Rice for adult dogs is a highly digestible food specially formulated to meet the nutritional requirements of adult dogs and is especially good for dogs with sensitive skin or digestive systems. All Arden Grange products are hypoallergenic and free from wheat gluten, dairy products, beef and soya. They contain no artificial colourings, flavourings or preservatives. Feeding Arden Grange can reduce the risk of dietary intolerances and allergies that can cause digestive disorders and skin complaints. Fresh Scottish salmon is used as the primary ingredient providing an excellent quality protein source that is both highly palatable and digestible. Higher level of omega3 fatty acids naturally present in fish oil may help to reduce the effects of allergies. Arden Grange Salmon and Rice is ethically produced using only salmon products which are fully traceable. Fresh salmon 26%; rice 26%; chicken meat meal; maize; beet pulp; refined chicken oil; whole dried egg; chicken digest; fish meal; yeast; whole linseed; krill; minerals; prebiotic FOS; prebiotic MOS; yucca extract; glucosamine; MSM; chondroitin; cranberries; nucleotides.